Jupyter Notebook is an open-source web application that you can use to create and share documents that contain live code, equations, visualizations, and narrative text. JupyterHub allows you to host multiple instances of a single-user Jupyter notebook server. When you create a cluster with JupyterHub, Amazon EMR creates a Docker container on the cluster's master node. JupyterHub, all the components required for Jupyter, and Sparkmagic run within the container. Sparkmagic is a library of kernels that allows Jupyter notebooks to interact with Apache Spark running on Amazon EMR through Apache Livy, which is a REST server for Spark. 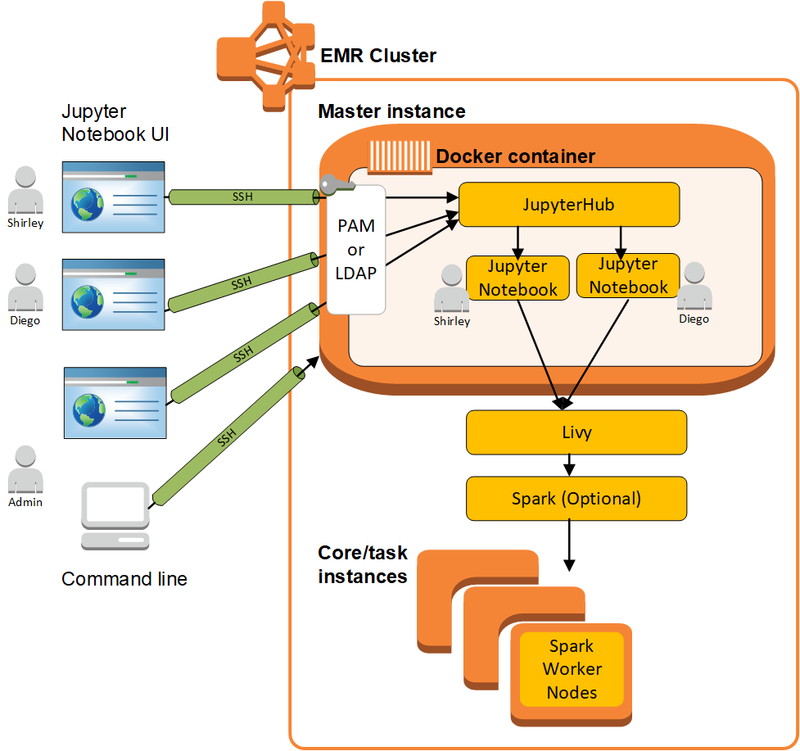 Spark and Apache Livy are installed automatically when you create a cluster with JupyterHub. The default Python 3 kernel for Jupyter is available along with the PySpark 3, PySpark, SparkR, and Spark kernels that are available with Sparkmagic. You can use these kernels to run ad-hoc Spark code and interactive SQL queries using Python, R, and Scala. You can install additional kernels within the Docker container manually. For more information, see Installing Additional Kernels and Libraries. The following diagram depicts the components of JupyterHub on Amazon EMR with corresponding authentication methods for notebook users and the administrator. For more information, see Adding Jupyter Notebook Users and Administrators. The following table lists the version of JupyterHub included in the latest release of Amazon EMR, along with the components that Amazon EMR installs with JupyterHub. For the version of components installed with JupyterHub in this release, see Release 5.23.0 Component Versions. The Python 3 kernel included with JupyterHub on Amazon EMR is 3.6.4. The libraries installed within the jupyterhub container may vary between Amazon EMR release versions and Amazon EC2 AMI versions. sudo docker exec jupyterhub bash -c "conda list"
sudo docker exec jupyterhub bash -c "pip freeze"